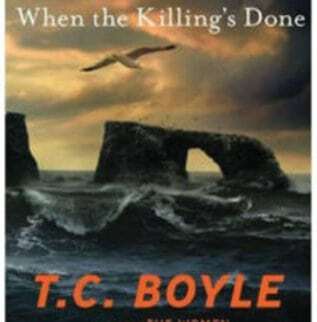 When the killing’s done by T.C.Boyle. Animal lovers come in different flavours. Consider the conservationist. Her love is targeted at the collective – a species or population that needs protection from extinction. But not all species are equal in her eyes, not all worthy of her attention. She chooses wild over domestic. Rare over common. Native over exotic. Contrast her with the animal rights activist. His attention is focused on the individual animal, his love governed by a single principle – no animal shall be harmed or killed. An all-encompassing love, without exception. At this point, if you are thinking “two sides of the same coin”, think again, for there is no love lost between these animal lovers. Their fault-line is killing. The conservationist will not hesitate to kill one kind of animal to protect another. But killing of any animal is anathema to the activist. And he will do whatever it takes to prevent it. Take the example of Rob Puddicombe- bus driver and animal rights activist(1). In the early 2000s, the US park service decided to eradicate black rats from Anacapa – an island near Santa Barbara, California – by spraying rat poison from a helicopter. The rats are believed to have colonised the island in 1853, while escaping from a sinking steamer. The park service’s justification for eradication was that the rats were decimating the island’s population of Xantus’ murrelet – a small native seabird – by eating their eggs. But Rob wouldn’t have any of it. To him, rat and murrelet were equal. Along with a friend, he sailed from Santa Barbara to Anacapa and furtively spread food pellets mixed with Vitamin K all over the island. Vitamin K was an antidote to the rat poison. Unfortunately for Rob, he and his friend were spotted, arrested and put on trial – probably the only people ever tried for the crime of rat feeding. Though Rob was found “not guilty” on account of insufficient evidence, his attempt to save the rats failed and Anacapa was soon rat-free. T.C. 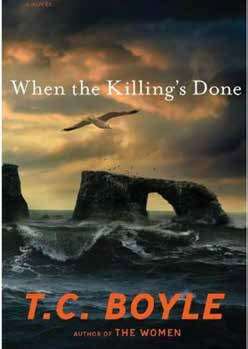 Boyle’s 2011 novel “When the Killing’s Done” is inspired by the Anacapa incident and other face-offs between the park service and activists in the Channel islands. Boyle takes these incidents and constructs a gripping drama around them involving two characters. Alma Boyd Takesue, a biologist with the National Parks service, wants to rid the islands of introduced invasive species – animals and plants both – to help protect the native species, who, she believes, are the islands’ only legitimate residents. Standing in her way, always, is Dave LaJoy (inspired by Rob Puddicombe) – owner of a home entertainment store chain, wealthy and with time on his hand, who has found his life’s calling in the protection of animals. All animals. The story is told in two parts, each centred around a battle between Alma and Dave. The first is based on the Anacapa incident I described earlier. In the second, the action shifts to Santa Cruz, and involves feral pigs, golden eagles, bald eagles, sheep, dwarf foxes and skunks – I will let you read the book to figure out how the fates of these animals are intertwined. But the book is more than its central plot. Boyle explores the inconsistencies and contradictions that characterise our personal relationships with animals. Take Dave. He is an animal rights activist for whom “the loss of a single animal…is intolerable, inhumane and just plain wrong”. But he is okay with animals killing other animals. And he feeds cat kibble to the rats. He doesn’t wear leather, rescues greyhounds from racetracks, and doesn’t eat “meat”. But he eats dairy, eggs and fish. And traps raccoons that ruin his newly-laid lawn. But he doesn’t kill them; just moves them elsewhere. Or take Alma. She is convinced that invasive animals need to be eradicated, but it still saddens her to see a dead feral pig, gladdens her to see a pair of rescued racing greyhounds (till she realises they are Dave’s) and is moved to act when she encounters a beached seal pup. Like Dave, she too is a lacto-ovo-pescatarian. When her car runs over a grey squirrel, emotional response and ecological knowledge collide in her head – should she stop and help this poor animal in pain, which is common in its range and at no risk of extinction, and risk being late for a meeting that will determine the fate of numerous species? It is these ironic moments that are, for me, the book’s highlights. In the end, if you are an “animal lover” yourself, you will enjoy the book just for the animals it contains. Here is a sampling to whet your appetite: rat, murrelet, pig, eagle (golden and bald), sheep, fox, skunk, raccoon, snake (rattle- and tree), flying fish, raven, squirrel, sea urchin, shark, scorpion, seal, Angora cat, albatross, aphid, bat, cricket, damselfly, dolphin, frog, gecko, goat, mule, whale, turkey, greyhound, egg, bacon, calamari and sushi. Hari Sridhar is a postdoctoral fellow at Indian Institute of Science, Bangalore, harisridhar1982@gmail.com.